Keeping this to mind, we are brining creative, innovative computer generated paintings with decorative framing. Here are the thousands of way to put a smile on your wall, table or showcase! We bring you most innovative, creative and exclusive paintings with most innovative, attractive, gorgeous yet thermatic and attractive framing at most affordable rates. These paintings increases the beauty of residential places and is able to capture the keen interest. The entire concept is ideal for individual or corporate gifting. Now you can create poetry on your wall. That too with gorgeous colors, innovative shapes and simple yet attractive framing! Buddhist art originated on the Indian subcontinent following the historical life of Siddhartha Gautama, 6th to 5th century BC, and thereafter evolved by contact with other cultures as it spread throughout Asia and the world. Face of the Buddha represents perfect state of inner calm and awareness. In our paintings of Lord Buddha you will find peace and serenity. Aum is a mystical Sanskrit sound of Hindu origin, sacred and important in various Dharmic religions such as Hinduism, Buddhism, Sikhism, and Jainism. Aum is also symbol of absolute. You will find the mystical sound on your wall by these paintings. Lord Shreenathji grants us heights joy and inner peace. Shreenathji's Mukharvind is unique and its ornaments are so gorgeous and rich that your heart will fill of pure devotion every time you will watch these paintings. We offer unique Floral Art designs to décor your bedroom and drawing room. These paintings are available in single, two or three pieces options. Their shapes are sizes are so exclusive and unique that fits to any wall. With our flower art paintings you will feel the freshness of flowers on your wall. African art represents beauty in black! Here are masterpieces that represents rich heritage of Africa. The colour and shapes of these paintings are unique and distinguish. 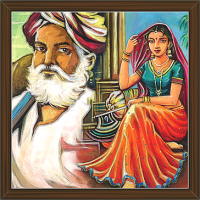 Rajasthan, the land of desert and kings have very rich heritage. It has unique style and colours that appeals artist over the world to fill the canvass with colours. Rajasthani ornaments and dressing creates eye-catching images. Here are some gorgeous masterpieces. Besides of unique paintings, we offer matchless framing options that would add exclusive beauty to both, your wall and the painting. Here are our framing options. These wooden frames are available with attractive laker polish and matchless finishing. Few frames are available with decorative embossed handwork. jute thread has been used as hanging support to give entire frame ethnic view. We offer mettalic art painting of Ganesha, Radha Krishna, Buddha, Rajasthani Paintings, Floral Art Paintings, etc.